Some bands, like stars, burn brighter than others, they stand out and emit radiation across an array of electromagnetic spectrums. They are a colossal force, whose music form emission nebulas that emit light of various colours. The sound waves they transmit travel with high-energy photons, through a series of interstellar regions or pathways. When I think of Puressence I think of an emotionally driven and visceral band, who burned bright, whose mesmerising music ingeniously connected with its audience consciously, subconsciously and subliminally. Through the jangly riffs, torpid tremors, quivering quakes and brooding baselines, Puressence, were a law to themselves, with a fierce uncompromising spirit. They were something special, a prevalent part Manchester’s underground scene, with labyrinthine links to our deepest depths of our collective psyche. With the bonus of having a charismatic lead singer, Mudriczki’s is the bona-fide front man whose exceptional vocals encapsulates the bands motif, whilst acting as an autonomous instrument within itself. Unlike other Manchester front men, Mudriczki is a true singer, a powerhouse, whose heightened sensuality seeps and soars without the cliched swagger or bravado. Through the textured tones and transcendental awakenings, Puressence were a band that delved deep and whose intricate and flickering riffs singed against metallic veneer. Like all stars of great magnitude, Puressence’s proportion of light wasn’t always visible through the naked eye. They weren’t your average Manchester band, but a percolating mix of jangly rock, post-punk, neo-psychedelica, ethereal ambience, dreamy ballads, stripped down acoustics, baroque-pop, spiritual soulness, token sophisti-pop, industrial clangs, noir-esque suspense, prowling intensity, devilish charm, melancholic discord, sultry stacatto, renaissance opulance, tight-fisted rock, dark new-wave goth, reverberating rawness, 60s fire-flies folk, witchywoo wailings, nocturnal soulbearers, luminate moonbeamers, purveyors of empiricism, cluster space-beeps, lovelorn lyricists, rumbling beat masters, mediators against the crashing riffs whilst shoegazing on an Eastern horizon. They were singed with dark romanticism, anthemic modesty and driven by a formidable force. Or in short, criminally underrated. However, when a star burns so bright, they are at risk of exploding, but then you realise that this is part of their natural state as everything that collapses and dies is born again. Most stars take millions of years to die, and in Puressence’s case it’s hydrogen fuel burned, so it could expand and become a red supergiant, so vast it could engulf other planets. The birth of Mudriczki’s new band, “Nihilists”, has all the makings to blow themselves apart, self destruct and become a supernova explosion. They have the capacity to outshine all the other stars in their galaxy, with a mass greater than the sun. I feel a powerful force at work. Some things in life grow best in the darkness. Some essence from their previous formation may have faded, but that’s just a trick of light. “Nihilists” are a mesmerising neutron star or a black hole, residing in the nebulous corners of our minds. They are a gravitational pull, a mass of dark electronica, expanding within a compressed space. They are an existentialist thrill, whose debut double-A sided single “Wall space” and “Over is so Over”, released in Novemeber 2016, showcased the ever evolving talent of Mudriczki. With its opening eerie synths, “Wall space” awakens by the elongated drones, like demons emerging from the abyss, tinged with spectral synths, industrial clatter and ghostly whispers, hounded by the pulsating beats. It’s an impressive track, whose muffled vocals and Depeche Mode-esque throbs, benchmarks Mudriczki’s leap into murkier depths. In an age where music tilts towards style over substance and is often overly produced, Nihilists artfully breathe life into the guitar infused electronica, whilst creating a cinematic catharsis, along with the baroque-infused synths, crashing curves, jangly riffs and Clannad-esque echoes, “Wall Space” pulsates and slithers underground, self-destructing and renewing along the way. With its jangly riffs, robust beats and orchestral sweeps, “Over is Over” is a beautiful composition of tumultuous reflection and epiphanic episodes. It is a drawn-out hypnosis, which sees Mudriczki’s indecipherable vocals, move smoothly between altered states. Through the vortex of droplet-riffs and bellowing bass, “Over is Over” is poetically crafted, which mutates between eerie fog and euphoric highs. It is an immaculate production, which sees the Bacharach-esque trumpet and sun-drenched reverberating riffs obscure the darkness and reflect the light. An all-consuming affair, “Over is Over” is a post-modernist exorcism, whose New-Order-esque riffs probe between the Oldfield-esqe chimes and film abstracts, creating a thrilling transition into the deep nihilistic unknown. 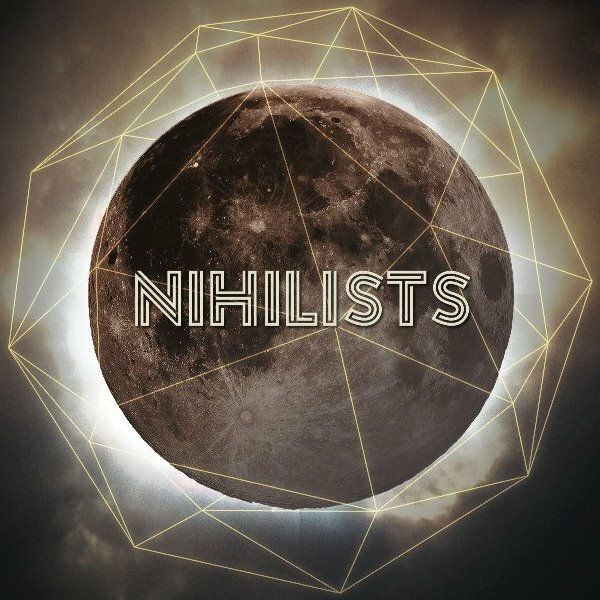 With their debut album in the pipeline, Nihilists are a band really worth checking out and I couldn’t recommend them enough.